Market Stall 2.0. At our offices on the edge of the Borough Market, not a morning goes by where we don’t see traders struggling to make their way through crowds of tourists and commuters with heavy trolleys laden with produce and equipment for their stalls. We were inspired by this – as well as the market’s steampunk style – to imagine a simpler way to trade. For a truly pop-up stall design all the infrastructure, power storage, mobile hot and cold stores (and anything else a trader might require) could be contained within a 1.5m-deep subterranean box. The lid of the box would be packed with granite sets, doubling up as photovoltaic panels in order to power the stall lighting and counter units, as well as keeping any stored goods underground at the correct temperature. The stall would be handcranked up from a central floor slot and then hoisted from the central stem to rise, flower-fresh, to reveal its canopy petals to the world. 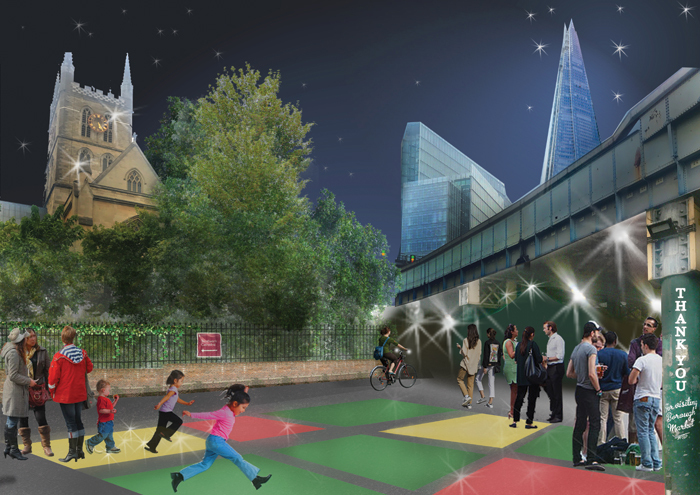 At the end of trading, the stall would be wound back underground, disappearing from view and transforming the market back into a vibrant area of public realm, perfect for nocturnal urban socialising. Architectural designers (top to bottom) Joaquin Roca Arribas and Borja Santoro Gutierrez and architectural assistant Emma Jayne Hunter are part of the team at Neil Tomlinson Architects, a 10-year-old practice specialising in masterplanning and transport schemes, as well as retail-led generation and residential design. Projects include airport schemes at Blackpool, Parma, Exeter and Biella and the masterplanning of the New Covent Garden Market in London.